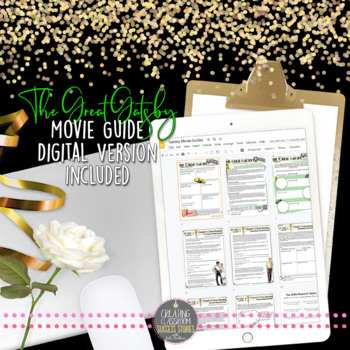 Add rigor and interest to your The Great Gatsby unit or movie study with this The Great Gatsby Movie Viewing Guide! The activities included could be used with your study of the novel or movie, but they are not novel to film comparisons. This pack works with the 1974 or 2013 version of the movie to study a film as a text. Each of these no prep, standards-based activities and assignments is classroom tested and student approved, and will have you covered for up to two weeks! Student Experience: Students will be able to enjoy watching the movie while digging deeply to understand and analyze the layers of this great American novel. Begin the mini unit with a quick study of the 1920s, and you'll have options for that. Meaningful questions will keep students active while watching, and carefully selected close reading passages will get text in front of students' eyes after the movie. Students won't miss important plot details, symbolism, or theme elements either because I've included interactive tools for you to use to cover those elements as well. Last, creative responses to the movie are also included: character collages, My American Dream projects, and writing prompts. If you want students to analyze the movie and show their understanding of literary and thematic concepts through their viewing of this movie, then this is the pack for you. 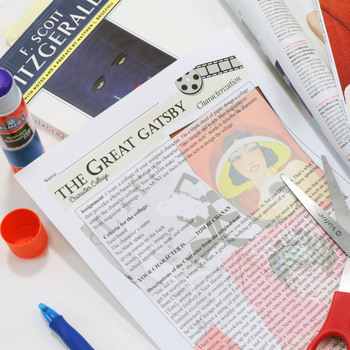 I've used this pack so many times successfully in my class, and students report they love the Gatsby unit! 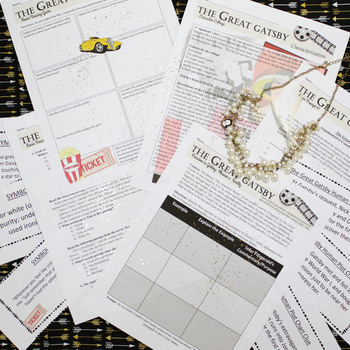 When you finish your Gatsby study, check out my The Great Gatsby Escape Box Game Sold separately here. ♥ "This was an amazing resource. It was quick and easy to use. The students enjoyed the movie and the worksheet was incredibly thorough. Rather than just being a general comprehension assignment, this resource asks students to analyze the movie and various literary elements." ♥ "This resource was great and saved my life at the end of this school year. We did not have time to actually read Gatsby but I wanted my students to still have some exposure. With this pack, I felt like they got just as much out of the movie!" ♥ "What a neat collection of activities. Love this!" ♥ "Great resource, contains more than expected/needed so I was able to extend the lesson!" ♥ "The resource is extremely helpful, and I think that it is written in a student-friendly way." ♥ "Such a great way to make sure my students are watching the movie and being held accountable!" ♥ "This resource was FANTASTIC! I really enjoyed the close reading passages and the other activities in this mini-unit. I was able to adapt some of them to meet the needs of my students." 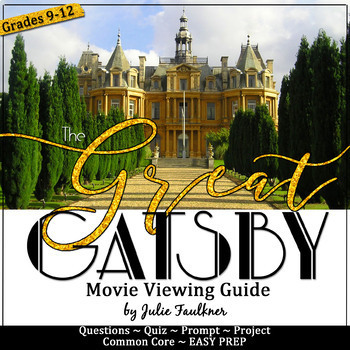 ♥ "Great resources for teaching the Film Version of Gatsby while still exposing students to the important parts of the text." ♥ "Once again Ms. Faulkner delivers! This unit plan was so easy - I barely had to read the printouts ahead of time. Truly print and go! The kiddos loved the art and fonts and I appreciated the book excerpts to drive home the green light motif among other concepts. Thank you for sharing this!" ♥ "I absolutely LOVE this resource! I love the way that she has formatted this resource. It is made to catch the student's eye and keep their attention." ♥ "I used a different guide last semester. My students this semester enjoyed this one more. I will be using pieces of this unit in the future when I teach Gatsby." ♥ "I loved this bundle! The questions were clear for the students to answer and it was easy for them to use the worksheet during the movie for following along and what not. The quiz questions were also clear which helped me ESOL students. I used this bundle for my U.S. History class. However, it is perfect for ELA as well."